Soft and powerful, elegant, flowery. An orginal cognac. Serve ice cold. This cognac has a powerful nose of fresh vanilla. It is accentuated with notes of old leather. Mesmerizing nose, exceptional tasting with old Russian leather, Alpine Honey and barbarian figs. A cognac of jasmin and violet notes, gives rise to power and complexity. Honey, prune and old leather are woven in the mouth. A cognac of freshness and subtlety, light rancio. No tasting notes of this Godet vintage cognac. Onctuous and supple in the mouth. Powerful and long finish. An internal fire lighting up a unique experience. Cognac Cask super strength 71,4% TAV Ageing: 4 years in French Oak barrel Blending: 100% Fins Bois. Tasting review: Eye : Clear, bright amber Nose : Rich and complex. Notes of sweet dried fruits, fig, butter, fresh vanilla, spices, and hints of leather Palate : Warm, with honey, nutty flavors. A good length finish that's both clean and crisp. Eye: Deep amber with glinting golden flashes Nose: Ever evolving. Generous, mysterious, and complex. Palate/Finish: Well rounded, smooth, with a well-aged undercurrent of rancio. Long, satisfying finish. Founded in 1782, Godet Cognac ranges amongst the oldest cognac houses. The Godet family has been based in the seaside town and former trading hub La Rochelle for 400 years and since the very beginnings of cognac production, has played an important role in perfecting this culture. Since 14 generations, Cognac Godet has been in the hands of this family, who have placed tradition and excellence at the heart of their business. Godet is one of the few cognac producers, who use the Folle Blanche grape, the original cognac grape. Up until the 19th century, most cognacs were made with this grape, but after the entire Charente vineyards were destroyed in a disastrous plague, the new grapes that were planted needed to be more resistant. The Ugni Blanc grape was chosen to replace Folle Blanche. Godet has got numerous products, classically ranging from a VS to an exquisite Réserve de Famille and various vintage cognacs. Godet also produces wine and champagne. They have a red wine called Chateau Seigla Laplagne from the appelation Puisseguin Saint-Emilion. Their premier cru champagne is produced in the Champagne region called La Montagne de Reims and Godet's domain is 9 hectares in size. Godet has also created a liquor called Pearadise, one of their old cognac reserves blended with natural pear extract. The activity shows an innovative business approach of diversification, covering different products to do with winery. 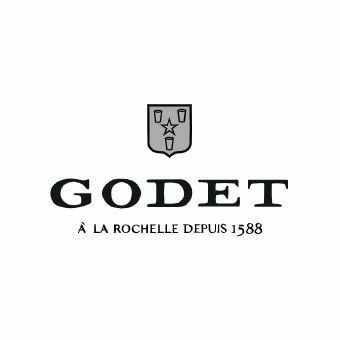 The Godet family's expertise in wine-making results in cognac, wine and champagne - an excellent standing for a family-run company. The business is headed by Godet president Jean-Jacques Godet. His three sons Jean Eduard, Maxime and Cyril are actively contributing in the company. They are running the international operations, being based in New York, Shanghai and London respectively. In 2008, Godet Cognac added a new product to its impressive range, the cognac "Antarctica Godet". It was inspired by Jean Jacques Godet's sailing trip to the South Pole, which took two months. His and his team sailed from La Rochelle to Antarctica in order to discover the spirit this cognac should have. On his return, Jean Jacques created a Folle Blanche cognac and called it Antarctica. Its character was to be like that of the South Sea: icy, pure and unique. The design of the bottle as well as the website created specifically to document the travel log of this extraordinary journey, show the adventure that lay both in creating such a cognac from this rare grape as well as in the nature of this expedition. Contact Godet Cognac's estate in La Rochelle to find out about visits. i was given a bottle of Godet 1970 petite champagne, cannot find any information on this item. hope you can help. thank you. Godet is one of the most underrated cognac brands ever! their blends are very elegant, and I just love their XO fine champagne cognac which I will buy again for this season's holidays. I also tasted the Godet Antarctica.. it did not blow me away. But in general, Godet cognac is a nice company, with good products! must have been said..